At the theater Kawarasakiza in Shiba Shinbori, a new kyogen entitled Kibi Daijin Shina monogatari was staged. Playing the scene in which Kibi Daijin of our [imperial] court is presenting a tribute of gold to Emperor Xuanzong of Tang, in a ceremony of such-and-such between Japan and Tang, is Ichikawa Danjuro of thunderous name [great renown] . . . . [His] deliberation with An Lushan and others in his customary eloquence ought to be marvelous. As the author [playwright] is the venerable Kawatake [Mokuami] . . . . 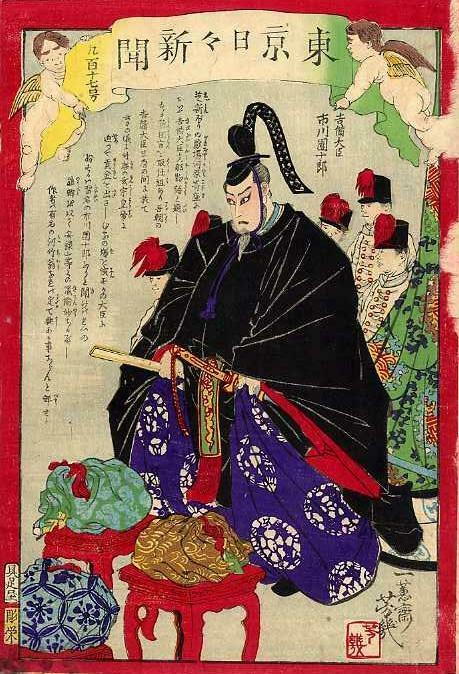 The protagonist of the print is identified in the upper right corner, by the green furl of the banner, as "Kibi Daijin / Ichikawa Danjuro" (吉備大臣 / 市川團十郎) -- in a notably low-key manner without cartouches. Shiba Shinbori (芝新ぼり) is now part of the Shiba area of Minato ward in Tokyo. 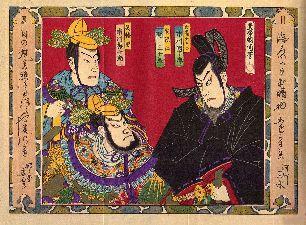 kyogen (狂言 kyōgen), today most often associated with a short "farce" performed between longer plays, was at the time the most common reference to an ordinary kabuki play. Kibi Daijin Shina monogatari (吉備大臣支那物語) -- "Minister Kibi / Tale of China" -- was a new play written by Kawatake Mokuami (河竹黙阿弥 1816-1893). The "monogatari" in the title is usually written 譚 (monogatari). The play was performed numerous times over the next several years. Many prints of the more stylized "playbill" or "actor" genre celebrated Ichikawa as Kibi. Kibi Daijin (吉備大臣) -- "Minister Kibi" -- refers to Kibi no Makibi (吉備真備 695-775). Kibi is one of the most famous Japanese to have gone to China during Tang period. 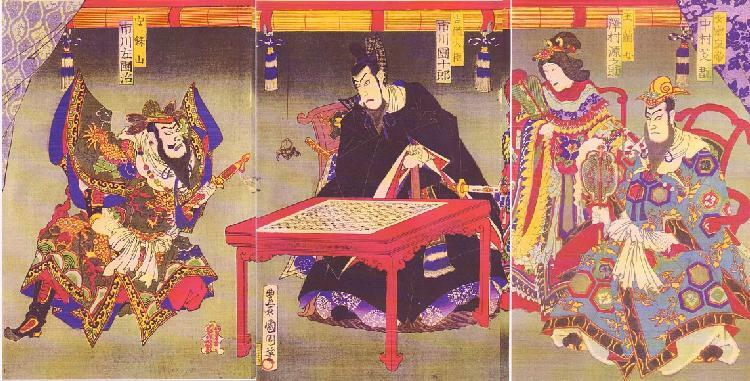 He first went to study, in 716, when he returned, in 735, he brought back copies of numerous Chinese texts, go (the board game he is playing in the triptych to right), and a biwa lute, among other items of great demand and interest in Japan at the time. Having spent nearly two decades in China, where he passed high level exams and circulated with all manner of literati and officials, he quickly rose through the ranks in the Yamato court. He was sent to China again, as an envoy, from 752 to 753. It would have been during this trip that he met Xuanzong (see below) and An Lushan (see below). Xuanzong (玄宗 Hsuan-Tsung 685-762, reigned 712-756) is glossed Kensō in Sino-Japanese. He was the emperor of China at the height of the Tang (唐 T'ang) dynasty (618-907) when Japan's ties with China were particularly close. 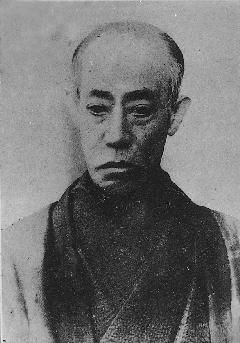 Ichikawa Danjuro (市川団十郎 Ichikawa Danjūrō), the 9th actor to perform under this name (1838-1903), was one of most popular kabuki performers of the Meiji period. He is also the subject of TNS-40 Danjuro and foreigner. An Lushan (安禄山 circa 703-757) is An Rokuzan in Sino-Japanese. A Chinese warrior of Turkish and other descents, An was one of Emperor Xuanzong's closest military confidents.